Hayley Lauder and Lee Alexander were part of the Glasgow City side that lost to FC Barcelona at Petershill Park. Glasgow City midfielder Hayley Lauder and goalkeeper Lee Alexander were both in the starting eleven as City welcomed FC Barcelona to Petershill Park in Glasgow, for their second leg of the UEFA Women's Champions League tie. City held off the Catalan side well, but in the end, it was Barcelona who got away with the 3-0 victory, 8-0 over the two legs, and proceeded to the next round. Reflecting back on the game and the performance of the team, both Lauder and Alexander highlight the weight of the experience that they can take from the two games against Barca. "It is disappointing by the margin we’ve lost but I think we have to be proud of our performances, We’ve shown we do have quality in this side and we were well-beaten by a very, very good side and there’s no shame in that. I think we’ve got a lot of young players out there that have experienced a really high level of football for the first time, and that can only better us as a club, being exposed to that," said the experienced attacker. Alexander agreed, "Obviously playing against the calibre of the team in Barcelona, we didn’t move the ball and it was difficult for us. I think we coped a lot better, obviously, we’re disappointed with the scoreline but at this stage in the competition you know that you’re going to come up against really good teams, and Barcelona is one of them." 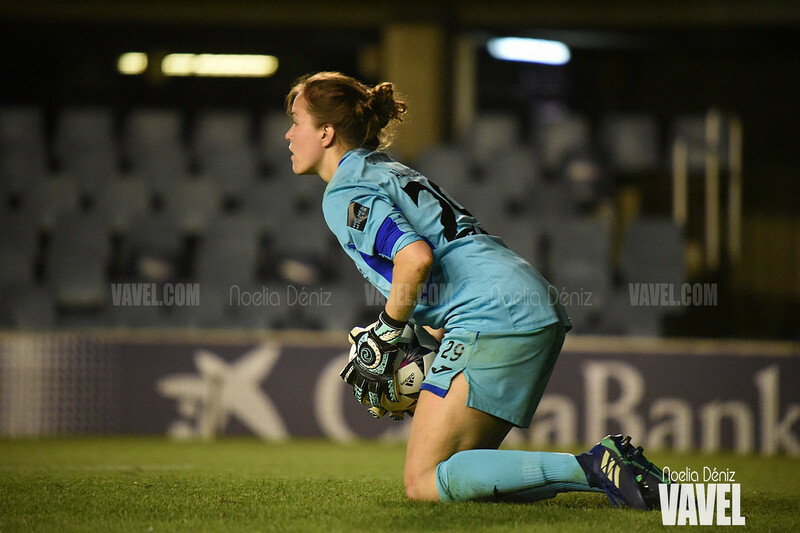 Taking heart from their performances in the competition, the goalkeeper continued, "We’re out of the competition at this point but I think we’ve done well as a club where we are, to progress through, and ultimately we’ve been put out by a very good side. 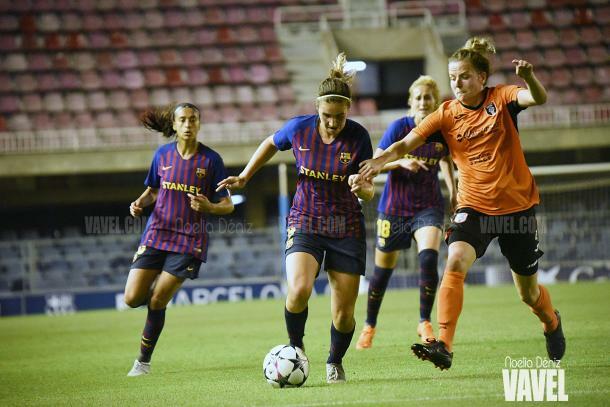 Barcelona’s squad features the likes of Euro 2017 winner and 2016/17 UEFA Women’s Player of the Year Lieke Martens, England international Toni Duggan as well as integral parts of the Spanish national team and going up against such opposition can be quite intimidating. How does one prepare for top opponents? "It’s the games you want to play in, you want to test yourself against the best and their style of play, it’s difficult to defend against. Obviously, we’re disappointed in the goal margin we’ve conceded but again we have to put our hands up and say we’ve gone against top top players." The goalkeeper continued, "We’re maybe not as experienced at this level, but it gives us the experience now, that we know that we can compete at this level and it’s a bit more experience for players to move on and we’ve got it all to come next year. Glasgow City just won their 12th consecutive league title, breaking their own record for the number of consecutive titles won in the domestic league and going unbeaten, after having faced a hard battle for points with Hibernian during the season. But after the tough exit out of the Champions League, City look ahead to the next season and what they want to achieve. A Scottish veteran, Lauder is always looking to improve, "We just set ourselves goals and a club like Glasgow City playing within the Scottish league, we look to win the cups. That’s something we didn’t do this year, we didn’t win any cups, but we won the league, and that was paramount for us." She went on, "So I think that it’ll be the same next season, obviously, we want to do better in the Champions League. For a club like Glasgow City to get to the last 16 is a massive achievement in itself when you see the other 15 teams that are within the competition and I think we just try and better ourselves each year. We’ve got a great group of players that are wanting to do that so hopefully, we just push on." The Scottish women’s national team qualified for the World Cup 2019 for the first time, a feat that warranted a lot of attention and support from all directions, even from the First Minister. Are we looking at a new era for women’s football in Scotland? "In the backlog of getting to the Euros [in 2017], that was our first major final that we were at, and I think that the difference in that with the popularity of the sport is we only keep growing and growing and the investment is getting there," Alexander started. "Our league is developing, it’s obviously been a lot tighter this year for us, we’re delighted that we’ve been able to obviously secure the title but as a national set up it’s great to be able to showcase ourselves at the highest level, what else is better than the World Cup." With some agonising near-misses in qualification for major tournaments in the past, the goalkeeper is hoping the manor that Scotland qualified in will help them in the final tournament. "I think we’ve been deserving of it, we’ve had many many close calls in playoffs and obviously, we topped our group outright so it’ll be an excellent experience for us. We want to go there, and the government are allowing us to be at the platform to perform, and not just turn up."